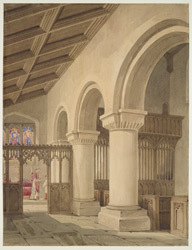 This watercolour depicts the interior of St Mary's Church in Redbourn. The church was founded in 1100 and its North Aisle was built thirty years later. Most notable in the interior are the heavy, Norman-style arches that contrast the ornate wooden rood screen. The tower, viewed from the outside, is unusual in it being rather squat and lacking any remarkeable detail.